All of the �first flowers� were photographed but for various reasons seven have not survived. The others have been collated and are shown on the next twenty-one pages. This was a tedious process � as is examining them all! 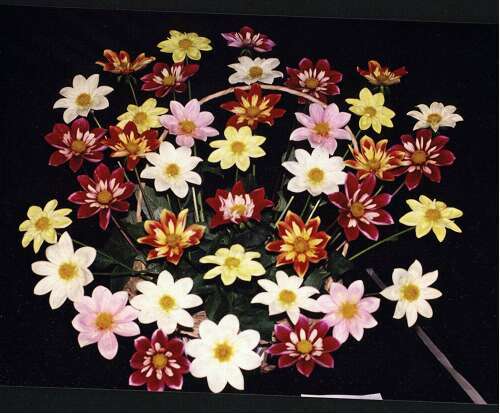 However they display, in a unique way, the large range of colours and colour combinations that occurred in this study of 619 plants as well as the imperfections. Inevitably the colours are in a sense �distorted� because they were not taken under equal conditions. The photographs were taken in the prevailing light and varied weather conditions that existed when flowers had two rings of stamens open and at the time of day when we were available to do the job. A digital camera was used and set on �macro� so photos were taken at about five or six inches (15 cms) from the flower. An Epson Stylus Photo 830 printer was used via Paint Shop Pro software. Both of these have distinctive traits so personalising this set of pictures. One example of a built in peculiarity is that the digital camera focussing and light control system seems unable to cope with bright red flowers � the colour is quite good but definition of the petals is very poor. Another is that (to my eyes) purples and deep reds in the photographs do not always correspond to the definitive information recorded at the time the photographs were taken � so the data used in the colour analysis is based on the written information. Hence a study of the photographs only would result in different data � we have relied on our visual interpretation at the time and contend that subjective as that very definitely is, that it is at least not affected by the software and hardware facilities used! The photographic media used is double-sided ink jet paper designed for the purpose � hence the vibrancy of the flower colours is not understated! Because all the photographs are presented with each flower filling the frame, the size of the blooms is masked. In practice some of the blooms were big (for collerettes) while others were quite small by comparison. Where blooms were unusual in size this was noted on the record sheets � this information has not been presented here as this was supposed to be a study, not a saga!